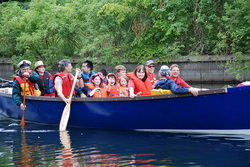 United was little more than a fibreglass hull, still wearing battleship grey paint, when the 65th Toronto Sea Scouts first found her in Penatanguishene. 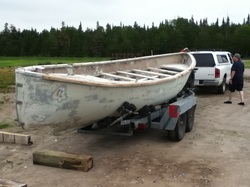 She was a mothballed Montagu Whaler that had seen service with the Royal Canadian Navy for many years. 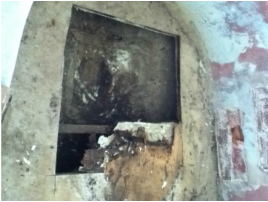 Her first stop was at a sand blaster, to get rid of that old lead paint. 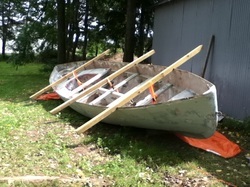 Her rotten gunwales and decks were removed and holes were patched. 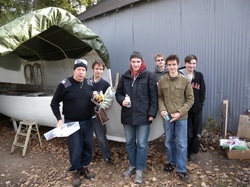 The Venturers and Master Hunter after finishing the painting. After sanding and scraping, United got several coats of fresh new epoxy paint. 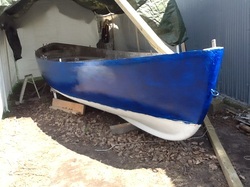 And here she is with the first coat of her new blue paint. The United on her maiden voyage at the Snake Island picnic. 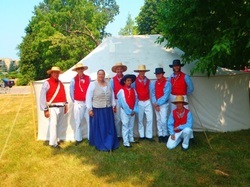 The crew of the United during the reenactment of a landing in the War of 1812 at Niagara on the Lake.